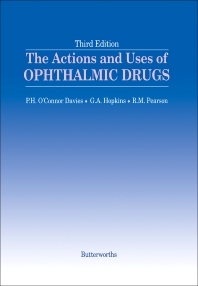 The Actions and Uses of Ophthalmic Drugs, Third Edition discuses the application and discrimination in the use of ophthalmic drugs. The book reviews the general pharmacological principles including drug nomenclature, pharmacological classification, pharmacokinetics, pharmacodynamics, and the use of these drugs. Ophthalmic drugs (cycloplegics, mydriatics, miotics) directly or indirectly, stimulate or inhibit a part of the autonomic nervous system connected to the intra-ocular muscles. The text investigates in detail the structure and function of this involuntary nervous system in the orbital region as it is affected by these drugs. The book explains the different drug classifications, their therapeutic and diagnostic purposes, including the ideal properties, indications, contra-indications, mode of action, or adverse effects of cycloplegics, of mydriatics, and of miotics. The book also describes the uses and characteristics of local anesthetics, stains, anti-infective agents, and miscellaneous agents (antihistamines, vasoconstrictors). The text explains the different types of contact lens solutions, application of ocular first aid, as well as, the possible adverse ocular reactions that can occur during ophthalmic drug therapy. This book is suitable for optometrists, pharmacists, pharmacologists, students and professors related to the discipline of optometry and general medicine.